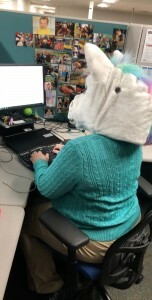 So Sis wore her unicorn head and gave out candy every time it was a little, little kid because she was worried my costume would scare them. 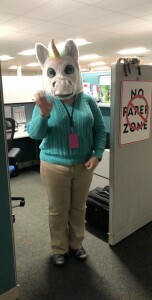 Several of them were scared of her giant unicorn head too. I’m not surprised - its eyes follow you everywhere you go! 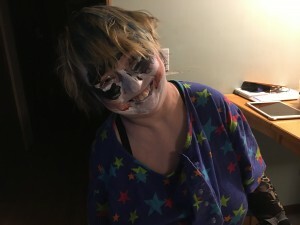 I just did a quick makeup job. Hadn’t decided until last minute if I was gonna go happy-creepy or creepy-creepy for the clown. I mean, Sis was happy-creepy, seemingly cute & sweet but somehow still terrifying. 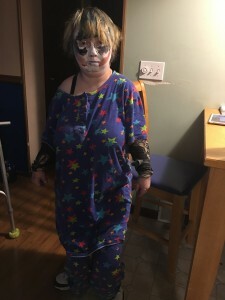 But when it came time for makeup, I decided just to run with the creep factor. The costume is actually pajamas, so yay, I now have an extra pair of pajamas. One little 7 year old told me she loved my costume. Her parents should maybe worry about her, lol. We had a 13 year old girl Castiel come to the door. She was super cute & I told her I loved her costume, but oops, I thought she was The Doctor. She didn’t have a blue tie, just a striped tie, it threw me off! I felt bad. I told her about my Castiel Angel wings I got from the Halloween store though and she’s gonna go look for a pair. We also had a teenage Michael Myers who just stood on the porch, said nothing and stared. I was like, “Damn, that’s scary,” and then he said in a very deep voice, “Trick. Or. Treat.” It was freaky. Then we had a 9 year old Venom come to the door and he was so surprised I knew who Venom was, even his Dad was like. “Someone got it!” I’m guessing people had been thinking he was Spiderman all night. I asked if he’d seen the movie and if they did a good job and then his dad and me talked for a minute about Venom, so that was cool. We also had a little 6 year old Black Panther. After I gave him his candy, I looked right at him and said, “Wakanda Forever, little sir”. His whole face lit up. Sad for me though, I had a tooth pulled yesterday, so no candy for another week, but we had about 2 little sandwich baggies of candy left, so that’s my special treat for when I’m back on solid foods. Let me tell you, if you need to diet, just switch to soft food for a week. I mean, you will be ravenous and starving, but I gotta be losing weight, damn. What a sucky week to be on food restriction though - I want my candy! Anyways, hope your holiday was a good one! Share costumes pics if you want - I’d love to see em! This entry was originally posted at https://dodger-sister.dreamwidth.org/246966.html. Please comment there using OpenID. 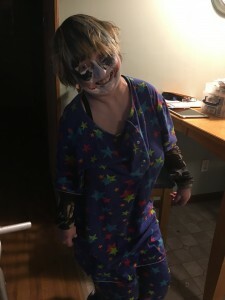 Clowns are scary but I love your PJs. I hope your mouth heals quickly. We also had a teenage Michael Myers who just stood on the porch, said nothing and stared. Eeeee, that would have creeped me out.